TRS MEMBERS— CALL/EMAIL COMMITTEE MEMBERS MONDAY, March 25! We won’t have another chance for TWO MORE YEARS! Calling all active and retired teachers, bus drivers, cafeteria workers, librarians, custodians, nurses, maintenance workers, classroom aides, secretaries, sign-language interpreters, counselors, police officers, administrators, and all other public-school employees!!!! Remember: the Texas Legislature only convenes every two years, so when this session ends, they won’t be able to make any changes to our health care and pensions for TWO LONG YEARS! Tuesday morning at 8 a.m., the House Pensions, Investments and Financial Services Committee will meet. In that meeting, they will discuss HB 9, which is OUR GREATEST HOPE at making TRS actuarially sound so those still working will be able to collect the pension you are earning now and those of us who are retired have hope of eventually receiving a long-overdue cost-of-living adjustment (COLA). HB 9 is MUCH better for us than the Senate version, SB 12, and we need to fight for it! HB 9 calls for the state to increase their contribution to TRS from the current, low 6.8% (compared to their contribution to the retirement system for all other state employees AND for legislators, ERS, to which they contribute 9.5%) to 8.8% by September 1, 2025. HB 9 does NOT seek an increase in contribution rate for already-cash-strapped TRS members and school districts, while the Senate version calls for an increased contribution from both. Additionally, HB 9 calls for a one-time supplemental payment (aka 13th check) up to $2400 for all current TRS retirees. The Senate version also calls for this supplemental payment but caps it at $500. While a one-time payment is not a COLA, by increasing the state’s contribution rate, TRS will become actuarially sound. Only when this happens will we be able to receive a COLA. 1. IF you can be at the capitol Tuesday morning, Texas AFT Retiree+ is hoping to “PACK THE HOUSE.” The committee meeting begins at 8 a.m. in room E2.026. The time and room are subject to change, so check when you arrive to make sure it has not been moved. 3. Although this committee does not directly handle our healthcare, I, personally, urge everyone to let the committee members know when you call and/or email that WE EARNED HEALTH CARE AS GOOD AS ERS MEMBERS’ HEALTH CARE! We canNOT wait two more years for them to ROLLBACK OUR HEALTH CARE! 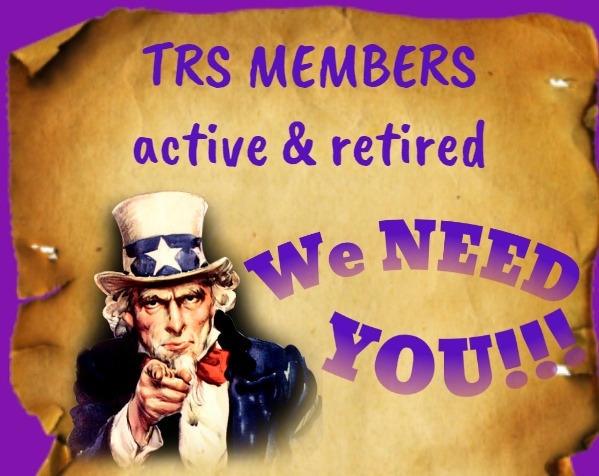 Calling ALL TRS MEMBERS! MONDAY, MARCH 11, IS A DAY OF ACTION! 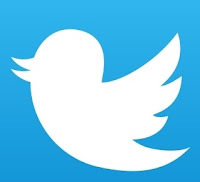 · Click here to find the contact information on your TEXAS HOUSE and TEXAS SENATE representatives. Click on their names for the contact information and CALL OR EMAIL THEM TODAY! 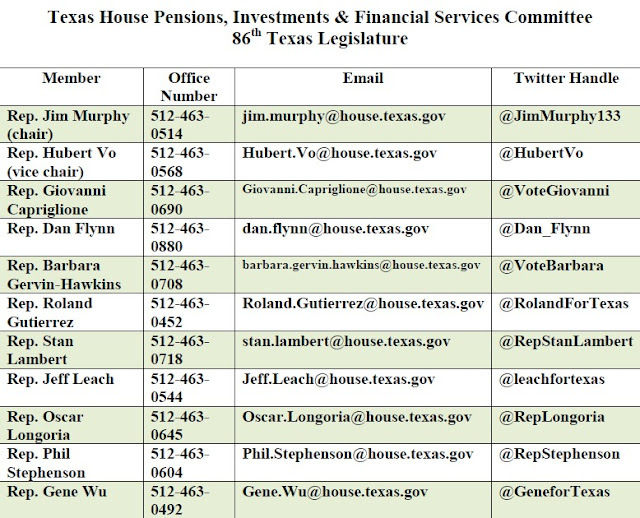 If you are a retiree: Let them know you support HB 9, authored by Rep. Greg Bonnen, because it gives TRS retirees a 13th check and increases the state contribution to TRS over the next five years, from 6.8 percent in 2020 to 8. 8 percent in 2025 and does NOT require an increased contribution from active TRS members or from school districts, as both groups are already cash-strapped. 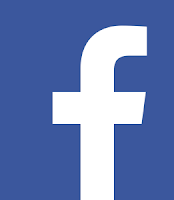 You may also want to express your opinion about our desperate need for a COLA (cost-of-living adjustment) since most of us have never received one AND respectfully but boldly telling them we need our affordable healthcare restored! Please consider contacting Rep. Greg Bonnen’s office to thank him for this great start AND respectfully asking him to add in RESTORATION OF TRS AFFORDABLE HEALTHCARE FOR RETIREES and a COLA. If you are an active TRS member (still working): Let your representative, your senator, the governor, and the lt. governor know where you stand on the $5,000 raise (currently for teachers and librarians only), about your healthcare costs, and about school funding. 2. Sign this petition: RETIRED EDUCATORS HAVE SUFFERED ENOUGH! IT’S TIME TO GIVE THEM A COST OF LIVING INCREASE! SHOW UP! STAND UP! SPEAK UP! And invite your family members, friends, current/former students, and your community to join us! Compare TRS of Texas and ERS of Texas - IT'S TIME TO MARCH! As you read through the chart below, which outlines the stark differences between the two retirement systems in the State of Texas—TRS of Texas and ERS of Texas—you will undoubtedly see, quickly, there is no equity. The extreme nature of this inequity is a result of the 2017 Legislative Session. Now, during the 2019 Legislative Session, there is talk that the 86th Texas Legislature is trying not to make our benefits worse. That is not good enough! We are calling for our legislators to MAKE IT RIGHT, to ROLLBACK OUR HEALTHCARE TO PRE-2018 BENEFITS (at the very least), to RESTORE OUR AFFORDABLE HEALTHCARE! Where is the EQUITY between TRS and ERS? ERS of Texas: Employees Retirement System of Texas is the pension and healthcare system for all other state employees, some higher-education personnel, and for retired Texas legislators. NOTE: All items in bold black above and below are links. Click on them for more information. before this plan begins to pay, except for preventive care. The overall family deductible must be met before the plan begins to pay. Preventive care benefits are covered at 100%. $0 for doctor’s office visits, specialty physician’s office visits, diagnostic lab services, allergy injections, routine eye exam, etc. No coverage gap or donut hole. Copays based on short-term or long-term medications with three tiers in each group. 30 or more years of service credit in TRS (including purchased service). ERS member’s service credit must be established (not withdrawn) with ERS at the time of retirement, and the member must be at least age 60 with a minimum of five years of service credit. Member may retire under the Rule of 80 if years and months of service credit (at least five years) and years and months of age equal or exceed 80. At age 50 with 12 years of service or at age 60 with eight years of service. How monthly pension is calculated. Gross monthly standard annuity is calculated by multiplying years and months of service by 2.3% per year (2.8% for 20 years or more of CPO service) and then multiplying the product of this by your average salary. The calculation of average salary includes base pay, longevity pay, Benefit Replacement Pay (BRP) and hazardous duty pay, if applicable. If hired on or after September 1, 2009, ERS uses the average of the member’s highest 48 months of salary. If hired on or after September 1, 2013, ERS uses the average of highest 60 months of salary. service percentage, see the table on page 4.
retirement are dependent upon legislative approval. Current salary of a district judge in Texas? $140,000 and it is being proposed during this legislative session that they receive a $21,000 raise. Who decides the salary of the district judges? THE TEXAS LEGISLATORS! The last time TRS retirees received a cost-of-living increase was in 2013. It was a 3% COLA, capped at $100 per month, and it only went to TRS retirees who retired before September 1, 2004. 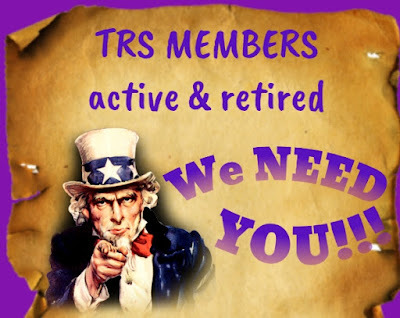 Any TRS member who retired after that date, 14 years ago, has NEVER received a COLA. ERS retirees have not received a COLA since 2001. Retirees who retired after 2001 have NEVER received a COLA. • any amount of time. • in FULL-TIME EMPLOYMENT (greater than one-half time) after a 12 full, consecutive calendar-month break in service after the effective date of your retirement. days after the retirement date. Same as TRS retirees under 65. Same as ERS retirees under 65. TRS members and all who support us, what do you think after reading this? I think it’s TIME TO MARCH! PLEASE JOIN ME! 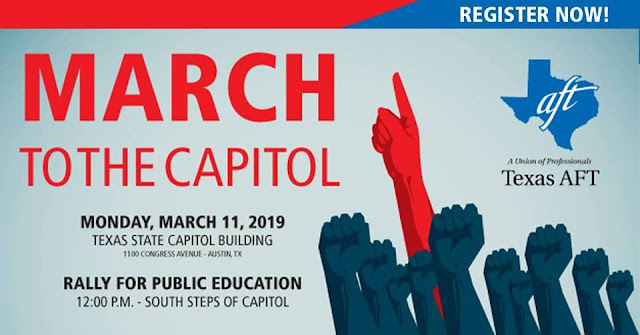 Note: Click here for more information on MARCH TO THE CAPITOL!